Will loves cookies! At our age . . . I don't often make them . . . But, Will needs a bit of comfort food today! I received a phone call at 2:34 am this morning; Will was calling from his hotel room in Lakland, FL. He was feeling horrid . . . with fever, chills and a bad cough. We are a team, so, even though we might be thousands of miles apart, we are always there for each other! Will called to let me know what was going on . . . For love, support, encouragement and, of course, prayer! So, while Will is on his way back home, I'm making comfort food . . . Homemade chicken soup, fresh baked bread, and fresh squeezed tangerine juice for an added kick of vitamin C, and COOKIES!!! 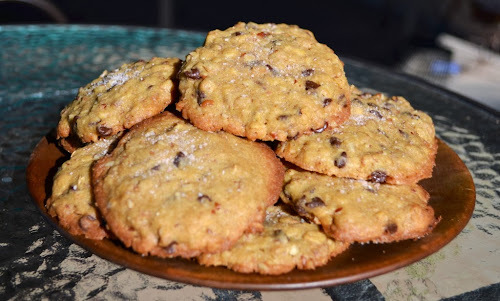 I started with a recipe from Anne Burrell at Food Network, and modified it for a healthier cookie! For instance, instead of old fashioned rolled oats, I used whole flaked 6-grain. Instead of 2 sticks of butter . . . I used 1 stick of butter and added 1/2-cup of organic extra virgin coconut oil (this time of year, my coconut oil is about the consistancy of shortening). If your coconut oil is liquified, place your measured oil in the fridge to harden it, before using. I used pure cane sugar, not granulated sugar for both the brown and regular sugars. Granulated sugars are made from GMO sugar beets (an unhealthy choice, on so many levels). Oh, and because coconut oil adds sweeting, I reduced my sugars by about 4-tablespoons or 1/4-cup! Preheat oven to 350-340 degrees Fahrenheit/176 Celcius. In a medium mixing bowl, combine flour, 6-grain/oats, baking powder, cinnamon and sea salt . . . Whisk together and set aside. In a large mixing bowl or the bowl of a stand mixer, combine sugars, butter and coconut oil. Using an electric beater or the paddle attachment of the stand mixer, beat together butter, coconut oil,and sugar until light and fluffy. Add eggs one at a time, beating them into the butter/coconut oil and sugar mixture. Mix in the vanilla. With a rubber spatula or with the stand mixer on low, gradually add the flour mixture into the butter/coconut/sugar mixture; mixing until just combined. Fold in chocolate chips and nuts with a spatula. 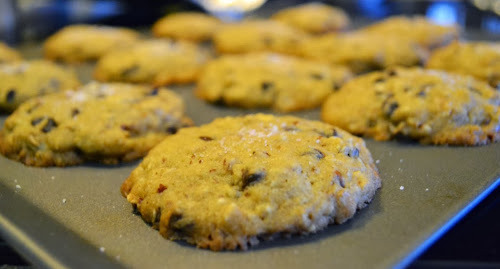 On an ungreased cookie sheet ~ Scoop out 2 tablespoon worth of cookie dough for each cookie (I used a 1-tablespoon scoop and just heaped it, and it worked perfectly). Gently press each ball of dough into a 1/2 inch thick disc. Bake in a 350-340 degree oven until cookies golden brown on the edges; about 12 minutes. 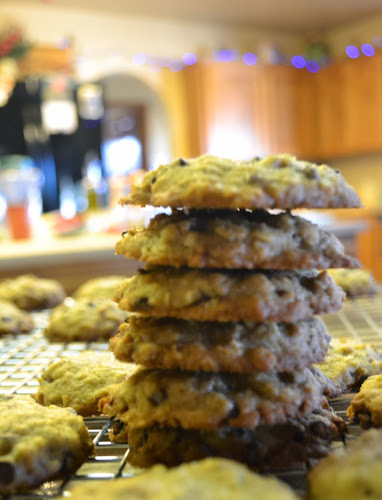 Julie's Tip: After baking a batch (you might want to bake just a couple cookies first), I lowered my oven to 340F and flattened my cookies to 1/2-inch to get the perfect cookie . . . see above). Add a pinch of salt flakes to the top of each cookie, immediately, as they come out of the hot oven, so the salt sticks. Gently flatten raw cookies balls to 1/2-inch thick discs. Baked cookies until lightly golden on the edges. 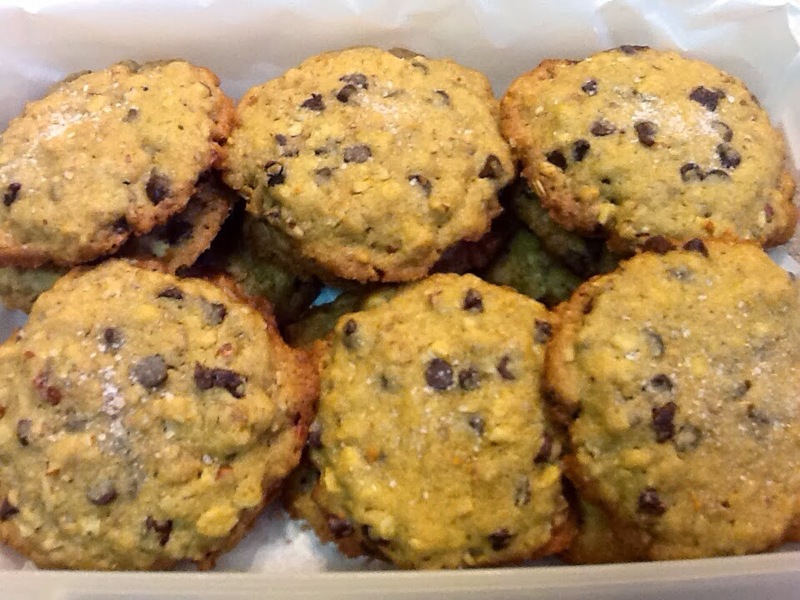 Mini Choco-Chip 6-Grain Cookies . . . Delicious! 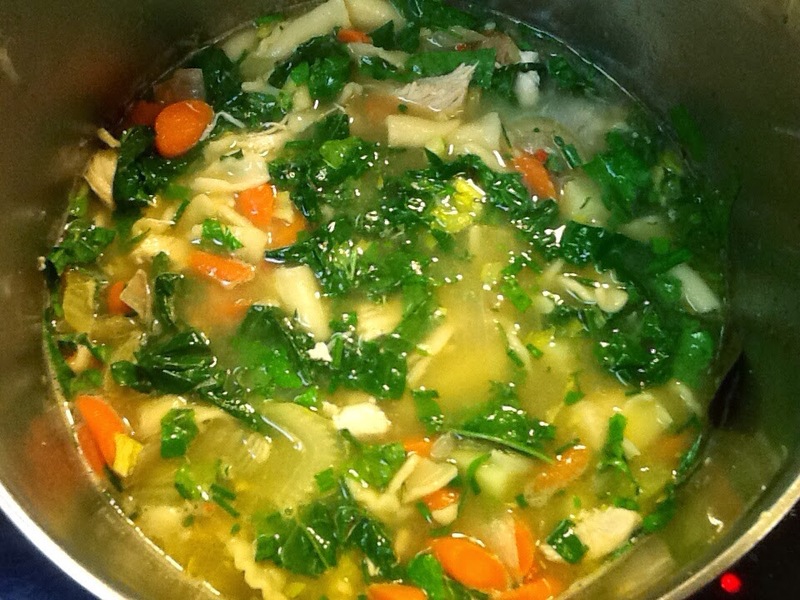 I still have to juice my tangerines, but my stockpot of chicken soup is simmering away on the back burner. I'll add the celery leaves, freshly snipped parsley, sage, thyme, rosemary, onion and garlic chives and a couple fresh leaves of kale (tough stems and ribs removed) just before serving . . The homemade bread is cooling on a wire rack. I have a half-dozen 6-Grain Cookies already tucked away in the freezer, for another day. The rest of the cookies are plated and awaiting the soon arrival of my "Traveling-Man" . . . Will! 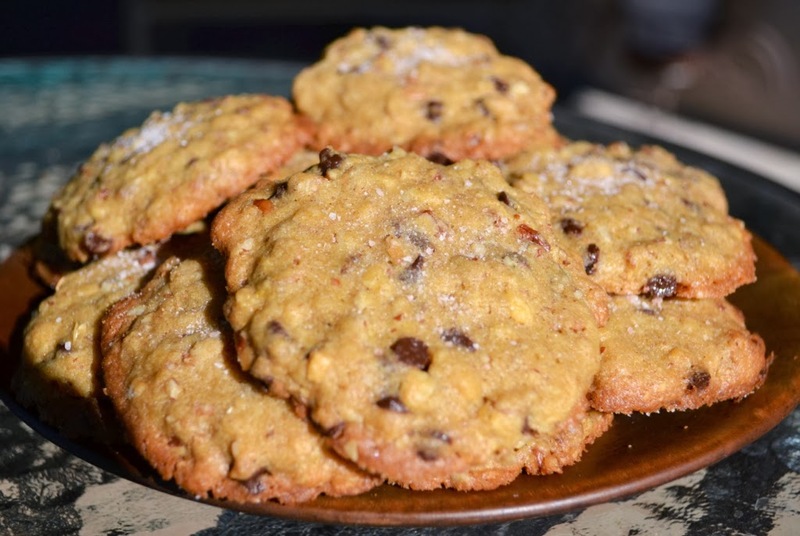 Adding a pinch of flaked salt makes these cookies extra special! 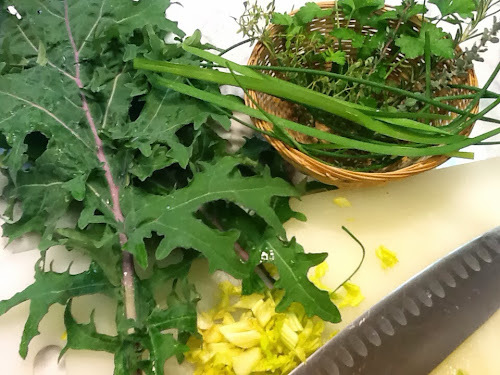 From the garden ~ Russian kale, celery leaves, parsley, thyme, rosemary, onion and garlic chives. Chicken soup with fresh herbs and kale.
. . . There are lots of homemade sights and smells to tempt his palette and sooth his tired, aching body . . . Over at Julie's!!! Cookies ready for the freezer!